Alkamind Swap This For That - A NEW Food Chart! Home / Acidic Foods to Avoid / Alkamind Swap This For That - A NEW Food Chart! We are faced with so many food options every day! Becoming healthier doesn't have to be about deprivation and taking away all of your favorite foods! Transitioning to an alkaline lifestyle is easier than you may think. By changing just a few eating habits you can make a huge difference to your health and your energy! Focusing on small simple changes makes healthy eating more manageable and sustainable over the long term. Swap out these acidic foods and you'll look better, feel better and slim down, too! When you GET OFF YOUR ACID, your energy goes to an entire new level you haven't experienced in years, your skin begins to glow, you sleep better, your digestion improves, and those stubborn extra pounds literally melt off your body! I'm not saying that you should always steer clear of your favorite acidic foods. 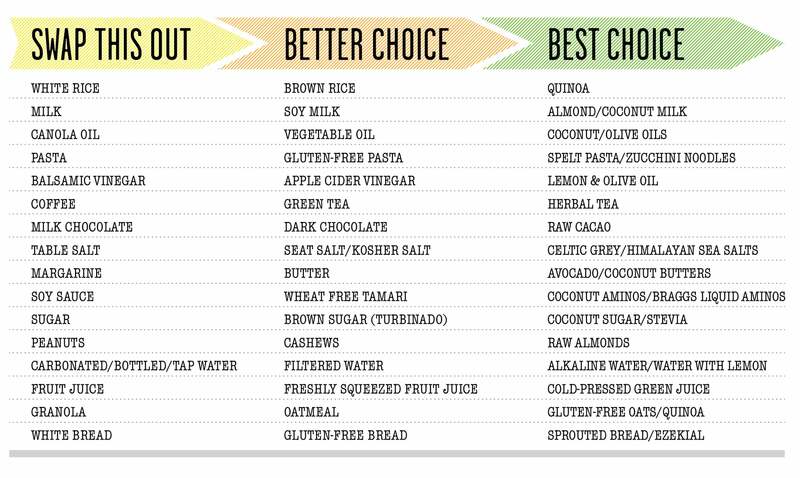 Think 80/20 in favor of alkaline foods and when you can, use this chart to swap out the bad with the good.